We are a leading Manufacturer of Acoustic Rooms, Recording Booths, Acoustic Wall Panels, Acoustical Ceilings, Acoustic Enclosures and Acoustical Doors from Noida, India. We are manufacturing the wide range of Acoustic Rooms. Our offered products are highly demanded in the market. Additionally, we offer our products at affordable price. Our organization specializes in offering a wide range of Acoustic Wall Panels, which are waterproof, easy to install and can withstand acid and alkali. These are manufactured using advanced processing and finishing techniques. Acoustic Wall Panels offered by us are available as organic coated steel and aluminum and possess excellent finish. Our company has achieved widespread recognition for offering Acoustical Ceilings to the clients. These products are easily fixed in various places such as offices, hotels, restaurant, retail outlets, educational institutes, etc. Offered range is precisely designed and manufactured with industry quality standards. We are an organization with a very modern and sprawling infrastructure which has all the latest and sophisticated facilities to manufacture Acoustic Enclosure. Our offered range is manufactured from using superior quality raw material and advanced technology. We offer superior Acoustical Doors to our clients at reasonable prices in the industry. We also offer customization of these products as per the requirements of the clients. These Acoustical Doors are used for various purposes in different industries. We are offering best quality Acoustic Foam which are widely used in theaters, movie houses, heavy machines, large auditoriums as well as in various other applications owing to its attributes to minimize the level of noise and vibration. These foams enhances the air resistance to lower down the noise and sound level. 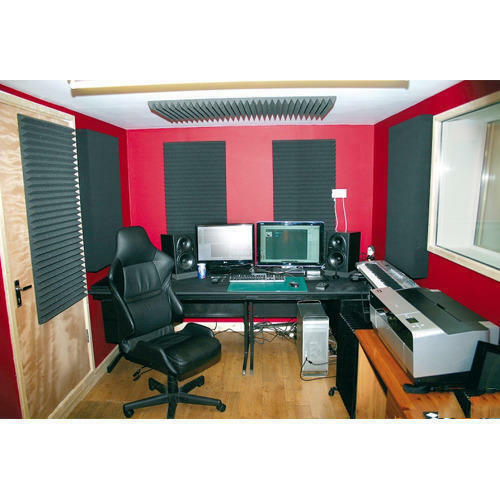 With aid of our expertise professionals, we are providing Recording Studios to our clients. It is greatly demanded among our customer base. The experts accomplish these Recording Studios management work by use of latest techniques. Optimum reverberation time is a compromise between clarity (requiring short reverberation time), sound intensity (requiring a high reverberant level), and liveness (requiring a long reverberation time). The optimum reverberation time of an auditorium is dependent on the use for which it is designed.